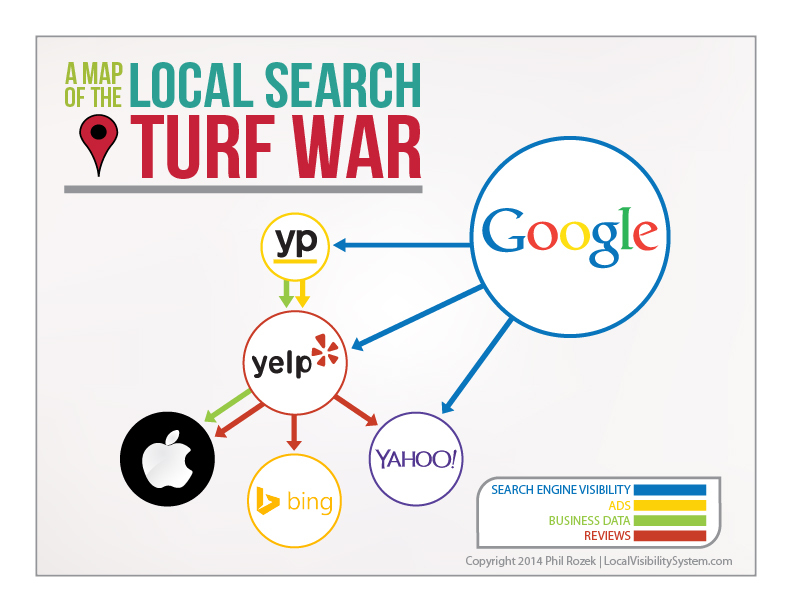 Lots of companies want to be the place customers turn to when searching for local businesses. It’s a battle a between Google on one side, and every other search engine and major directory on the other side. Greg Sterling recently said it’s between Google and Yelp – that they’re like Spain and Portugal back in the day: empires dividing up the world. Professor Maps said it’s more like the US versus the Taliban. I’d say the situation is that Yelp has made itself indispensable. It’s at the center of a gang-up on Google that includes Apple Maps, Bing Places, Yahoo Local, and YellowPages. They’re only small compared to Google. These 5 Big Boys exchange reviews, business data, now ads, and presumably money. They do it to get more local search “mindshare,” and ultimately more ad revenue. It’s a rough sketch. There are other big players in local search, like the CityGrid network. But none that’s ganged up on Google – at least that I can think of. Yelp feeds reviews to Apple Maps, Bing Places, and Yahoo Local. So if you have 5 reviews on Yelp, you have 5 reviews on those search engines. YP has just entered into a deal with Yelp in which its ads show up on Yelp, and some of its data on local businesses is fed to Yelp. Here’s the kicker: Yelp, YP, and to some extent Yahoo depend on Google for survival. Yelp in particular has organic rankings in Google out the wazoo. Most people who go to those 3 sites come from Google. Google can’t just squash these guys. YP and Yahoo consistently show up highly in the organic results because of the size of their directories, and because they’re old, more or less trusted sites. And Yelp is a destination. Rarely can Google not show Yelp. 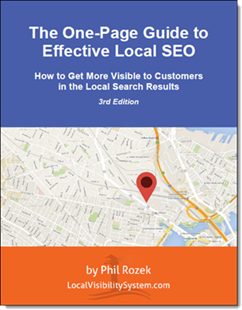 What does all this mean for your local-visibility strategy? Practical Lesson 1: Yelp may not be profitable (even after 10 years), but I can’t see them going away. They’ve made themselves indispensable with the (relatively) high quality of their reviews. You don’t have to like Yelp. But you can’t ignore your presence / reputation there. Well, you can, but that’s not smart. They’re the glue holding the other 4 big players together – against Google. Practical Lesson 3: Yelp’s advertising deals may become more compelling soon. Practical Lesson 4: Don’t totally ignore YP. Not a good idea to begin with, because it’s an influential site. I’m not saying you should pay them for ads. For now, just give your listing(s) a good tune-up. Practical Lesson 5: Get serious about Google+ reviews. As I’ve written, Google has been pushing reviews hard, partly to squeeze out Yelp (so that Yelp isn’t the de facto place to read reviews). For a while it’s been in Google’s interest to make them more rewarding for you, and that will be even truer as time goes on. How has this “gang-up” against Google affected your visibility strategy? Has it influenced the way you’re trying to “Google-proof” your business – or has it made you focus even harder on Google Places? What do you think might happen next?? P.S. Thanks to design dude David Deering for another great graphic. Good points Phil. I can see Google inching away from depending on other sites for reviews once they ramp up efforts to get reviews in Places. This is most likely still far away but it’s a move I think they’re going to take eventually. That being said, for certain industries there are still plenty of reasons to treat Yelp as a “little emperor”. It’ll be interesting to see what new alliances form and how Google reacts. Staying tuned in for your observations. Very true – good points. Thanks, Gene. Graphic really says it well Phil. Enjoyed your points. I was explaining this to a client and they totally got the complex implications of its Yelp and gang vs. Google. They are a highly reviewed business and definitely fit for testing out yelp ads while others might not make as much sense at this stage. We were also talking about Facebook activity/reach feeding into Bing social search. Seems as though Yelp is trying to provide more white glove help on the ad plans than Google. There are exclusivity opportunities to gather more of the market share just for signing up and contracts in place that don’t exist in Google world. Unless you have a pro overseeing your budget on Adwords (most local businesses are busy running their businesses) its hard to consistently command all of the market share. Thanks, John. Great point about FB. FB and Apple are the sleeping giants in the “turf war,” I’d say. And yeah, most business owners who personally stick their heads into AdWords get decapitated. It stretches the boundaries of the term “self-service.” If I hadn’t started learn the ropes in ’06-’07, I’d have a hard time getting into it now. Great graphic Phil. I was just saying on Linda’s forum that things are a bit different here in the UK. This week clients have received an email from Scoot saying that they are the authorised ‘RESELLER’ for Bing Places. That word reseller sounds ominous. Sounds like it’s going to be how Infoserve was with Yahoo Local – you could only guarantee to be seen if you paid for a premium listing. Seeing some prominence in a search for our images for the Yelp listing today as well. YP for us is, I think, Hibu – the old Yell. Hey Jo. Thanks for that great bit of info from ‘cross the pond! Phil: Thanks for the article and the analysis. Its an interesting development. I don’t believe either Greg’s or Mike’s comparison’s of Google and Yelp are appropriate. Google is monstrously larger than yelp by an enormous amount. Google’s annual revenues are about $60 billion. Yelp’s are about $230 million. That doesn’t mean they are relatively equal or comparable as was the comparison of Spain and Portugal during the age of exploration. I also think the comparison between the Taliban and anyone else infers “good versus bad”. I think both google and yelp are out for themselves and neither good or bad for smb’s. SMB’s need to protect their interests against both. More importantly smb’s need to figure out how to leverage their situation with both. Frankly Google can sink an smb or a website business at any moment. At present there are no checks against this power. Yelp, through its reviews has also had this effect. But it is weaker as yelp’s presence is weaker. It is strong in some regional markets and with some demographics. Yelp is weak elsewhere. Google is strong everywhere, excepting China (and possibly Russia). While the combination of “small players” with yelp is very interesting, I think the unknown with regards to size and impact is Apple Maps. Apple has a significant presence among devices. Its a minority but its significant. If and when apple maps becomes the default mapping for macs it will increase its visibility. At that time we might see a more significant “bite” into google’s enormous control of search and maps as a search tool. Great points, Dave (as always). Apple Maps does seem like a sleeping giant. I can’t imagine that it’s going to stay as underdeveloped as it’s been. Seems to me that only that relationship – between it and Yelp – might eventually rock Google’s boat. great article. Where do you think Foursquare fits into all of this? Thanks, Rory. Great question. FourSquare doesn’t fit into any of this (yet?). And it’s hard to read the tea leaves. Thanks for creating the visual. It makes things a whole lot easier to “see” the process. I just wanted to share that it looks like Yelp also provides business data to Yahoo and Bing in addition to reviews. The references below are directly from Yelp and Yahoo. Thanks for the article. I’m definitely sharing across my social networks. One correction, however, to the following statement: “Yelp feeds reviews to Apple Maps, Bing Places, and Yahoo Local. So if you have 5 reviews on Yelp, you have 5 reviews on those search engines.” The rate at which those reviews are picked up by Bing and Yahoo have some lag in my experience. When Where 2 Get It crawls the reviews on Bing and then crawls the reviews on Yelp for the same location, we often find discrepancies. Also if a business has a large number of reviews on Yelp, the reviews that appear on on Bing, Yahoo and Apple maps might be fewer. That’s a good point, Lily. Thanks.